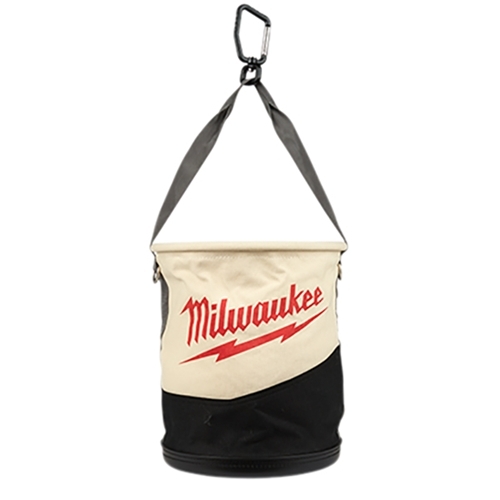 Milwaukee's Canvas Utility Bucket features reinforced canvas resulting in lasting durability and was built with our lineman and power utility trades in mind. The storage bucket is constructed of heavy-duty No. 6 Canvas with a durable double-layered canvas. It has an impact resistant base and two internal pockets. A rugged swiveling metal carabiner allows you to clip it into place wherever you are working. The utility bucket is rated for up to 75 pounds of carrying capacity. Built-in weep holes to allow water drainage after extended job site use. A reinforced ring keeps the bag open resulting in a longer lasting storage solution and two D-rings give you additional storage.